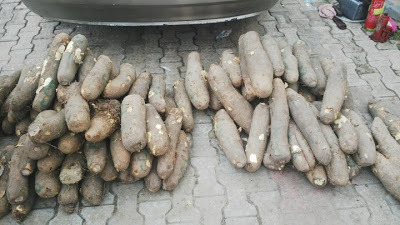 A Chief Magistrates’ Court sitting in Ilupeju-Ekiti, Oye Local Government Area of Ekiti State, on Monday sentenced one Adeleye Ajayi to two-year imprisonment for stealing 600 tubers of yam. Chief Magistrate Joseph Ayodele found Ajayi guilty on two counts of conspiracy and stealing. Delivering judgment, Ayodele stated: “The prosecution has proved its case of conspiracy and stealing against the defendant beyond reasonable doubt. “On count one bordering on conspiracy, the defendant is hereby sentenced to one year in prison, with an option of N20,000 fine. Earlier, the Prosecutor, Sgt. Adeniyi Famodimu, had told the court that Ajayi and three other convicts earlier sentenced, as well as one person still at large, between August and September 2017 conspired to steal the tubers of yam valued at N150,000.